United Nations dignitaries, motion picture celebrities, and a Who’s Who of world class visitors from government and entertainment have been hosted at Rancho Lilac over the years. Settled in 1865, the 2,300-acre property was homesteaded by William Keys, a miner who prospered in Northern California. A creek running through the property is called Keys Creek, and Keys Canyon is named after the original settler. In 1898, a post office called “Lilac” opened on the ranch. It served 50 homesteaders living near the Keys property. The first postmaster, appointed by President William McKinley, was Edwin A. Merriman. Later, the daughter of William Keys, Kitty Keys Merriman, became postmaster and served until 1912 when the facility closed. The post office, at one time the smallest in the nation, was moved in 2004 to the Valley Center History Museum. An early schoolhouse, Lilac School, operated at the edge of the ranch. It was moved nearby and remains as a private residence. In 1912, Keys sold the property to George V. Kirkwood, an Escondido banker, who named the site “Lilac Ranch”, a name derived from the wild lilacs growing in the area. Kirkwood built six cottages and several barns and outbuildings. In 1931, Kirkwood leased the ranch for operation as the Lilac Boarding School for Girls. The private school, which attracted problem children of celebrities, operated until the early 1940s. In 1937, the ranch was sold to Ken Purdy, a Beverly Hills real estate developer, who purchased the 2,250-acre property for $50,000. Purdy and his wife rebuilt the property, dug wells, and installed an electrical plant. In 1942, Purdy and his wife divorced and he moved to Escondido. Ken Purdy’s share in the property was sold to Mr. and Mrs. Douglas F. Fesler and their daughter, Marion Fesler-Purdy. By 1945, the wells had run dry, the property had deteriorated, and Mmes. Fesler and Purdy were forced to sell. 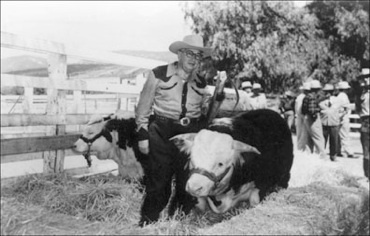 In December 1945, Rancho Lilac was acquired by Col. Irving and Mrs. Cecile Salomon who improved the historic property and began breeding herds of prize-winning Herefords, Hampshires and quarter horses. Their daughter Abbe (later San Diego City Council member Abbe Wolfsheimer) attended the one-room schoolhouse. In his capacity as a United Nations Ambassador and Undersecretary, Col. Salomon hosted world-class celebrities and political figures at the house. Col. Salomon died in 1979 and Mrs. Salomon died in 1999. Rancho Lilac, now at about 900 acres, remains a working cattle ranch. In 2011, the property was sold to Caltrans which will preserve the ranch in its naturual state in perpetuity through a contract arrangement with a conservation organization.